If you’re hosting a backyard party on a beautiful day in August, you want to be drinking with your friends, playing bocce ball and having a good time, not fussing over a meal that requires an elaborate preparation. Hiring reliable event staffing services in Toronto is one way to free yourself up and hang with your friends (whether it’s a lone bartender or a full on catering staff); another way is to prep a meal that is reasonably straightforward to cook and serve. 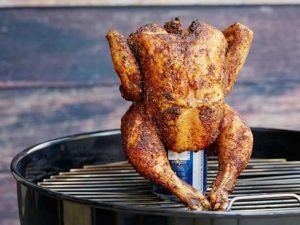 Beer-can chicken is the perfect example of this meal: you simply massage the chicken with oil, rub it down with spices, plop it on a half-empty beer can and throw it on the barbecue. An alternate version of this that we’ll explore today is a slightly more sophisticated cousin: wine-can chicken. Wine-can chicken requires a very simple substitution, adding just one super quick step to the process. You pour out the beer you were going to use in a glass (you should probably drink it, or give it to a friend) and then pour a few ounces of wine into the can instead, before affixing the chicken to it. The key principle behind beer-can chicken is that the can of beer on the grill heats up and steams the chicken as it is cooking, infusing it with flavor and keeping it moist. There are certainly some haters on the Internet who argue that this is an ineffective and silly way to cook a chicken, but results speak for themselves, and anyone who has ever competently cooked a chicken in this method knows that the end product is frigging delicious. Your instincts in this scenario might be to use white wine to cook the chicken (since fowl is typically paired with white wines), however, richer wines such as Malbec, Zinfandel or Cab Franc complement BBQ chicken much better, balancing the smokiness. As for the seasoning, fret not, it is incredibly simple. You’ll want to set aside a bowl and mix salt, pepper, crushed red pepper and cayenne in it and then rub this mixture all over the chicken once it’s been massaged with oil. Make sure to use lots of salt, as this helps the skin crisp up, and definitely make sure to wash your hands once you’re done handling the chicken. An excellent accompaniment to this meal is barbecued corn. Like the chicken, it is incredibly unfussy to prepare: you place the corn on the grill in its husk and cook it for 20-30 minutes. Within its husk the corn steams naturally as well, and even if you forget about it and leave it on for a very long time, it is extremely difficult to burn, overcook it, or dry it out. Finally, you’ll probably want some sort of vegetable as well, perhaps a refreshing summer salad to balance out the richness of the grilled food. 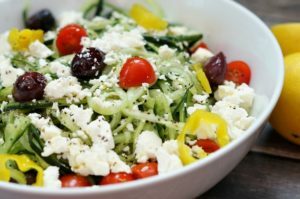 A Greek salad with feta and olives can serve quite nicely in this scenario, but since you worked so hard on the chicken and corn, you may want to call on friends to bring the salad.